Our friendly owl jugs were inspired by the one we saw in the Fitzwilliam Museum in Cambridge. The pattern of feathers on the owl is ideal for adapting to slip trailed-decoration. We made our first pair of owls for an exhibition at the Staffordshire Peak Art Centre in 1981. They were in our black colourway. We are now sometimes asked for white ones (no one has yet asked for blue or green). 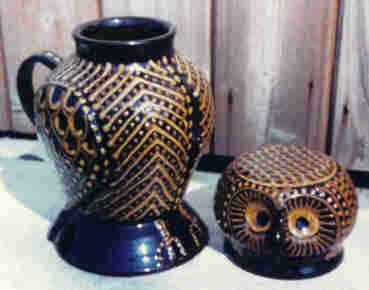 Traditional owl jugs have a removable head which forms a cup and at the same time keeps dust out. Ours does too. The Fitzwilliam owl was made, in the early 1700's, from quite coarse clay similar to that used for hand made bricks or tiles. It stands about 8 3/4 inches high. Another old owl jug, also 18th century, became famous in 1990 when it appeared on the Antiques Road Show TV programme in the UK having spent its previous few years being used as a flower pot. This rare Staffordshire owl was decorated differently, by the "scrumbled" slip decorating technique. It was bought for £20,900 by the City of Stoke-on-Trent Museum where it now lives. The earliest example of owl jugs that we know of is one discovered by Heinrich Schliemann at the site of the ancient city of Troy. This one had the features of an owl clearly modelled but no surface decoration. Later the Romans introduced into Britain the worship the Greek goddess Athena (or Athene). In Ancient Greek religion she was the goddess of war, handicraft and practical reason and was identified by the Romans with Minerva and by the Celts with Sulis. A Roman shrine to Minerva can be seen in Chester. She has an owl standing on her shoulder. In Bath (Aquæ Sulis) a small owl figure can be seen on the temple pediment.